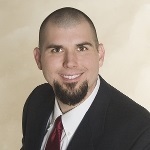 Jason joined the family business in 1998 after graduating from Westmont College with a degree in Philosophy. He began as a temporary employee to help out during a staffing shortage, but quickly realized he had a knack for the business. Over the next several years, Jason worked his way up through the Commercial lines department, and currently serves a dual role as both producing agent and manager of that department. Jason and his wife are active in their church and enjoy the opportunities for service and volunteering that this provides. They are committed to raising their family in the Central Valley and being active members of their local community for a long time.